This is a copy of a paper published in Perspectives, the newsletter of the Theory section of the American Sociological Association, July 2001. Also viewable as pdf file. Please cite as: Deflem, Mathieu. 2001. 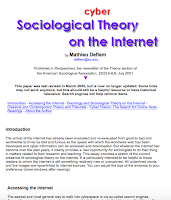 "cybertheory.htm: Sociological Theory on the Internet." Perspectives, newsletter of the Theory section, American Sociological Association, 23(3): 5-6, 8. This paper was first published online in 2001 and last revised in March 2005. Because of the many changes on the internet since then and now, the paper is no longer updated. It does have historical value, I suspect. The links are deleted from this text version, but the original version with links is still available via the Wayback Machine. The arrival of the internet has already been evaluated and re-evaluated from good to bad and worthwhile to trivial as fast and furious as the speed with which the worldwide web has been developed and cyber information can be accessed and downloaded. But whatever the internet has become over the past years, it clearly provides a new opportunity for sociologists to do their thing in matters related to their research and teaching. This essay provides a sketch of the current presence of sociological theory on the internet. It is particularly intended to be helpful to those readers to whom the internet is still something relatively new or unexplored. All underlined words and the images are hyperlinked to internet sources. You can adjust the size of the windows to your preference (close windows after viewing). More search engines can be found through any one search engine, simply by typing in [“search engines”]. So-called meta-search engines group together searches from various individual search engines. Examples include www.metacrawler.com, www.dogpile.com, andwww.mamma.com. Note that some recent e-businesses pose as search engines but actually pre-assemble information and do not establish exclusive links to webpages located on other servers. Examples of these sites are www.studyweb.com and www.about.com. From personal experience, I have found simple search engines most convenient, both those that only list individual pages (e.g., Google) and those that additionally classify pages in categories (e.g., Yahoo). On most search engines, multiple word (or phrase) searches have to be conducted by putting the entire phrase between quotation marks. For instance, the search [Emile Durkheim] will yield pages mentioning Emile or Durkheim, whereas the search [“Emile Durkheim”] will only retrieve pages that mention the full name of our discipline’s founder. Online searches and URL addresses are not case sensitive (e.g., [“herbert spencer”]). The SocioSite: Sociological information system based at the University of Amsterdam. The SocioWeb: "The sociologist, in his quest for understanding, moves through the world of men without respect for the usual lines of demarcation" (Peter L. Berger). Social Sciences Virtual Library: Keeps track of online information as part of The World-Wide Web Virtual Library. Sites are inspected and evaluated for their adequacy as information sources. The Dead Sociologists Index: The most extensive collection of primary and secondary writings on many a dead sociologist! Sociologists, Dead and Very Much Alive: A very long and detailed list of online materials on theorists. WWW Virtual Library, Sociology, Sociological Theory and Theorists: Single and multiple theorists. Special mention should also be made of the increasing availability on the internet of syllabi in sociological theory. The easiest way to retrieve online syllabi is through a keyword search. For example, go to a search engine and type in [“contemporary sociological theory”] or [“classical sociological theory”] or [“sociological theory syllabus”]. Syllabi not only provide ideas on how to teach theory, they often also include online readings. For example, the syllabus of the graduate theory course I teach at Purdue provides links from many different sources:Contemporary Sociological Theory, Syllabus (Deflem). Next to the sociology and sociological theory sites, search engines are the most convenient way to find both very precise and more general information. Including more keywords in a phrase will lead to pages on more delineated topics, whereas more general pages will be retrieved when the number of keywords is kept to a minimum. Not all information found through a search will be relevant, but search engines provide a brief description of the linked pages. An example may clarify the procedure. Suppose we are interested in materials on or by Craig Calhoun. A search for [“Craig Calhoun”] on Excite is less than useful, because it yields, amongst other pages, links to two no longer functioning pages on Calhoun’s work, a reference to a book co-edited by Calhoun, and a link to the website of the police chief of Hayward, California. However, the same ["Craig Calhoun"] search on Google is much more successful, as the first page retrieved is already a link to our colleague’s homepage at NYU. You can also narrow down a search by typing in additional information relevant to your topic. For instance, a search for [“Emile Durkheim”] inYahoo yields more than 3,000 webpages, while in Google we find no less than 11,000 pages. Examples to narrow the search could be [“Durkheim’s sociology of religion”] or [“aboriginal religion according to Durkheim”] or [“religion in Durkheim”] or [“Durkheim’s elementary forms”] and so on. As some of you may have noticed, not all searches will produce the best of results. But do not stop after just one search. It is exceedingly worthwhile to search repeatedly with different keyword combinations. The typical search takes a search engine anywhere between .06 and .89 seconds, so you really won’t waste a lot of time! Make sure that all the keywords in a search are meaningful (in the case of a computer that means consisting of three characters or more) and enter the words in the precise order in which you expect them to appear in a written document. For in the case of computers, indeed, il n'y a pas de hors-texte. Note that phrases with brackets, hyphens, or other signs can be retrieved with or without inclusion of those signs. For instance, all of the following search combinations will lead to good results: [“Max Weber’s Theories of Bureaucracy”] or [“Bureaucracy: Weber”] or ["weber’s bureaucracy"]”. A particular search will oftentimes also yield helpful information not originally looked for. For example, via Google we retrieve some 1,790 pages on [“Randall Collins”]. The top pages mentioned in the search results are all relevant, including links to Collins’ homepage, a page with online papers, and an announcement of a lecture by Collins in Denmark. One of the Collins pages provides a picture of the sociologist, not all too relevant for most of us were it not that the picture was posted on the occasion of a colloquium at UW-Madison. The colloquium turns out to be part of a theory initiative, theory@madison, organized by Mustafa Emirbayer and Phil Gorski, which has its own website with much more information, including interviews and online articles. It would be useful to save such accidentally found sites through the ‘add to favorites’ or ‘bookmark’ option on your computer or to cut and paste the URL together with a short-hand description for future reference. It was through such an accidental find that I recently discovered that most all of Durkheim’s books are freely available as online pdf files:perso.club-internet.fr/khoua/freetext.htm. JSTOR (full text, includes ASR and AJS). Academic Search Elite (partly full text, includes Social Forces). Web of Science (abstracts and citations). Lexis-Nexis (full text law reviews, newspapers, and more). Also, more and more academic journals are available online. The American Journal of Sociology, for instance, is now presented in electronic format (the journal’s articles up until the year 2000 are accessible via JSTOR). A subscription is needed for the online version, but email alerts with the table of contents of each issue are free. See the AJS website for more information. Auguste Comte and Positivism: This is a French site. It is for the time being unique, since, most regretably, we have lost--along with our great friend Bernard Doutremépuich--our American mirror site. The Durkheim Pages: These pages are devoted to the presentation of information concerning the French sociologist, Emile Durkheim (1858-1917). Max Weber, Ausgewählte Schriften: Hier finden Sie ausgewählte Werke Max Webers. Die Potsdamer Internet-Ausgabe "PIA" folgt den alten Ausgaben der 20-er Jahre (den "Marianne-Ausgaben"). Georg Simmel Homepage: Simmel's Books and Essays as well as Texts on Simmel. Die Ferdinand-Tönnies-Gesellschaft: Die Ferdinand - Tönnies - Gesellschaft pflegt das geistige Erbe von Ferdinand Tönnies. George’s Pages, The Mead Project Website: George's Page is a repository for documents by, about and related to the work of American pragmatist philosopher and social psychologist. Erich Fromm Website: Erich Fromm, sociologist, psychoanalist and humanist, whose more than 40 books are read by millions around the world, would have turned 100 on March 23rd 2000. Herbert Marcuse’s Home Page: Est. 1997. Join ongoing conversations on Marcuse's philosophy. Illuminations, The Critical Theory Website: A research resource for those interested in Critical Theory. Firmly based in Frankfurt School thought, this site maintains a collection of articles, excerpts, and chapters from many contemporary writers of and about Critical Theory. Michel Foucault, French Philosopher: This site contains information and resources on Michel Foucault (1926 - 1984) and research inspired by his work. Habermas Online: The most extensive website on the work of Jürgen Habermas, with primary and secondary materials. Berliner Luhmann-Kreis: Willkommen! Es erwarten Sie Texte, Termine, Listen, links und Adressen rund um die Systemtheorie Niklas Luhmanns. Feminist Theory Website: Hosted by the Center for Digital Discourse and Culture at Virginia Tech University. HyperBourdieu: A comprehensive, contextual, and referential bibliography and mediagraphy of Bourdieu's works and public statements. A very handy way to find a particular paper or chapter is to type in between quotation marks a very distinct phrase that appears in the text you are interested in. For example, in Yahoo the search [“open opportunities to various elites”], a passage from The Power Elite, will result in a link to a collection of quotes from the work of C. Wright Mills. On Google, the search [“ohne Gott ist eitel”] leads to several pages on Max Horkheimer. Also on Google, a search for [“sociological form of the stranger”] brings up a complete online version of Simmel’s famous essay. Note that search engines never capture all information on the internet, so it is always useful to also consult the specialized sociology sites. Also, let your colleagues know of your online efforts in sociology and sociological theory. On a final note, readers may be aware of my efforts to preserve the integrity of academic work on the internet (Deflem 2000, 2001). In my view, the internet is nothing but easily accessible space on computers and it is up to all of us to use that space --and use it well. With many people, especially younger folks and (prospective) students, now using the internet as their primary source of information, I appeal to my colleagues to make sure that online sociology is and will remain a part of sociology, not a commodity of e-commerce. A somewhat shorter print version of this essay was published in Perspectives, the newsletter of the Theory section of the American Sociological Association. Barker, Joe. 2000. “Finding Information on the Internet: A Tutorial.” Online Guide from the Teaching Library at the University of California, Berkeley. Deflem, Mathieu. 2001. “Different Views on About.com.” Letter with comment. Footnotes, ASA Newsletter, 29(4):10. ____. 2000. “University4Sale.com: The Educational Cost of Posted Lecture Notes on the Internet.” AFT On Campus, April 2000, p. 4. Kling, Robert. 1997. “The Internet for Sociologists.” Contemporary Sociology 26(4):434-444. Schneider, Andreas. 1998. "Sociology: The Internet as an Extended Sociology Classroom." Social Science Computer Review 16(4):53-57.